Filming those special occasions such as, weddings, family events, holidays and the cat is as easy as pointing the camera in the right direction and pressing the Record button. Shooting video is now as simple as taking a photograph, most current digital cameras, mobile phones and tablets have video recording capability. 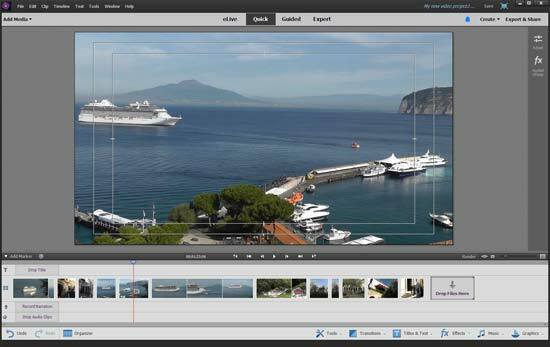 However, the art of producing a memorable professional looking video is in the editing stage. 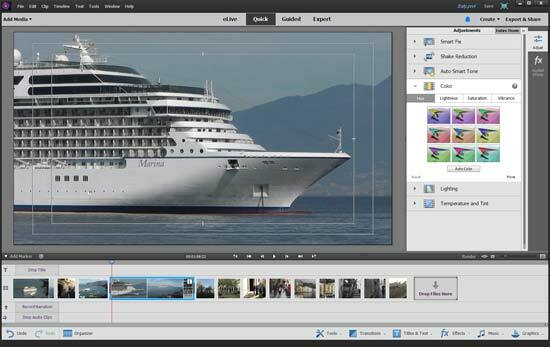 There are several video editing applications available at most price points, some may seem over complicated, whilst others may be too basic. 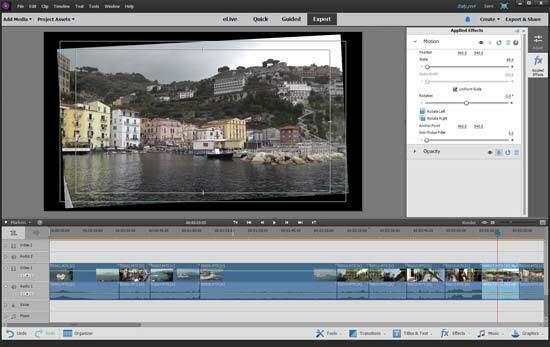 Fortunately Adobe has the software that can simplify the entire editing process with Adobe Premiere Elements 14, which retails for $99.99 / £79.99. Launch Premiere Elements 14 (PE14) and you are presented with a See What's New screen, this gives a brief overview of this latest version, from here you can launch Photoshop Elements, Organiser or Premiere Elements. 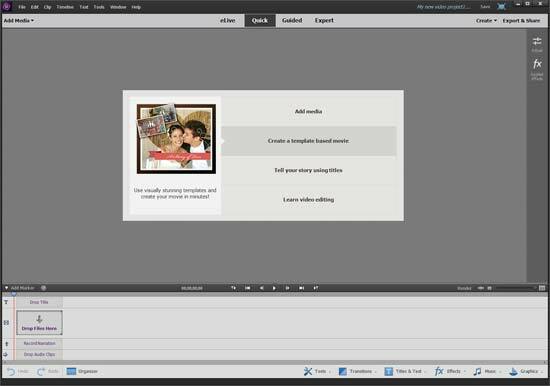 Clicking on the Video Editor button takes you to the eLive screen, this page has many useful links to web sites that will both instruct and inspire. 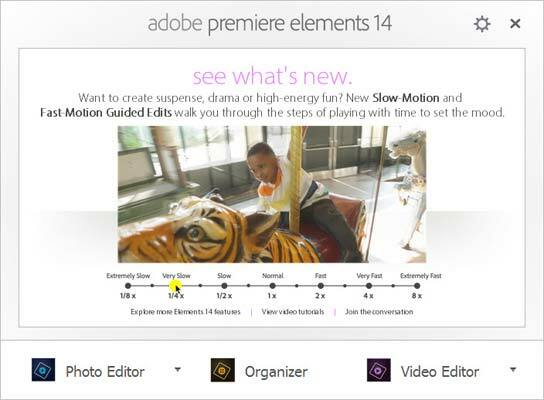 Oddly, some of links that I clicked on were videos created in either Premiere CC or competitors applications. However, there are plenty of links that are relevant to Elements, including a Getting started with a PE14 link. At the top of the screen are three other choices; Quick, Guided and Expert. 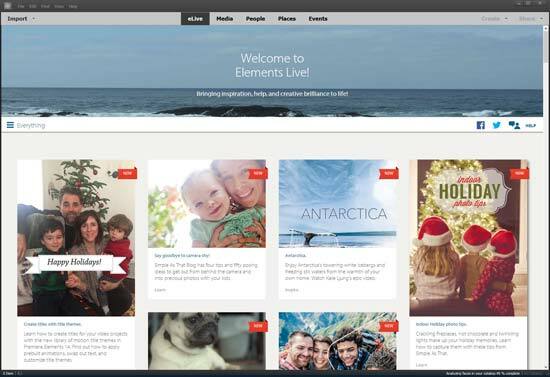 The Quick option is a good starting point for the inexperienced user, a menu panel opens with four options, select Add Media and a drop down menu appears on the left. 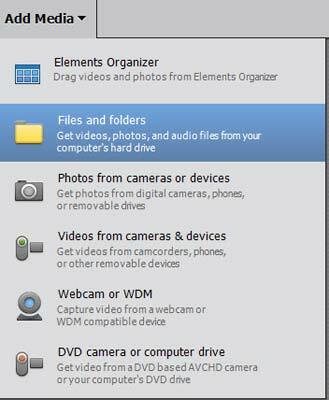 Navigate to the folder where you have your video files stored or import directly from your camera or camcorder. Select the clips you want to work with by either clicking on the first clip and whilst holding down the shift key select the last clip, this will import all the files within the first and last clicked clips. The other option is to hold down the Ctrl key and click on individual files, this will open only the files that are selected. 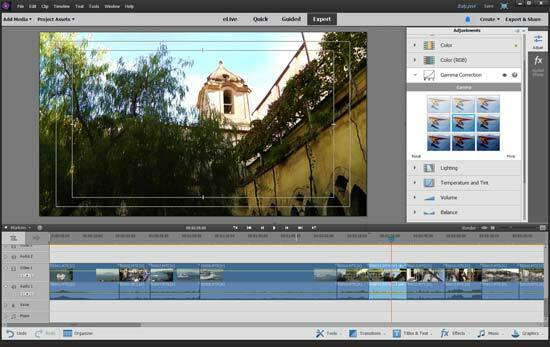 Each imported clip is automatically added to the Timeline at the bottom of the screen. Adjustments to individual clips or to the entire timeline can be made using the Adjustments tab which is located on the right of the preview window. From here you can use Smart Fix, Shake Reduction, Auto Smart Tone, Colour, Lighting and Temperature, the last three offer a 9 grid variations style panel, just click on the look you want. If you add an adjustment that doesn't look right then pressing the reset button will cancel that particular effect, leaving any other applied effects in place. 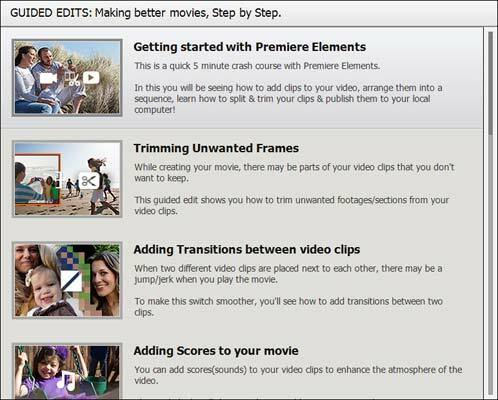 Directly below is the Applied Effects tab, this gives you the options to scale, rotate and remove flicker, you can't apply the applied these effects to an entire timeline only to individual clips. Further effects can be added using the FX Effects tab at the bottom of the screen, I will come back to this later. Clips on the timeline can be moved by dragging into any position within the timeline, this is where the fun starts with video editing. 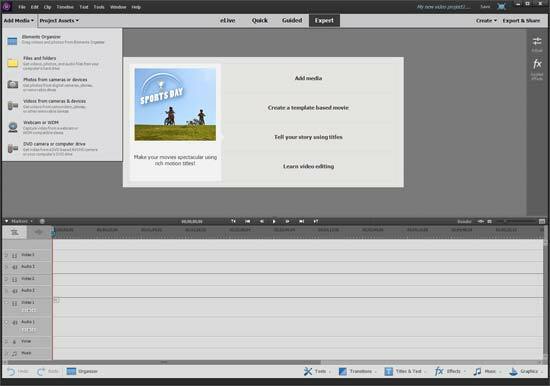 The next tab Guided provides an animated Step by Step Guide to video editing with Premieree Elements. A small fly out box provides an overview with an animated highlight on the feature that is being explained. Clicking on the top More Info button launches the PE14 help screens, from the internet. The guide is basic, I do think Adobe could have produced something with more dynamic appearance with this tab. However, there is still a lot of useful information on how to use PE14. The last tab Expert, is where you can let your creativity loose. The timeline has now been expanded and you can have up to 10 video and audio tracks stacked - (not sure who would use 10 tracks on top of each other). The Adjustment tab and Applied Effects is still on the right, but now there are more options available, including Colour RGB, Gamma Correction and audio settings. The Applied effects Scale and Rotation are hard to control using the sliders, straightening the horizon can be difficult as the slider reacts very fast. Holding down the Ctrl key and moving the slider allows for more precise control. 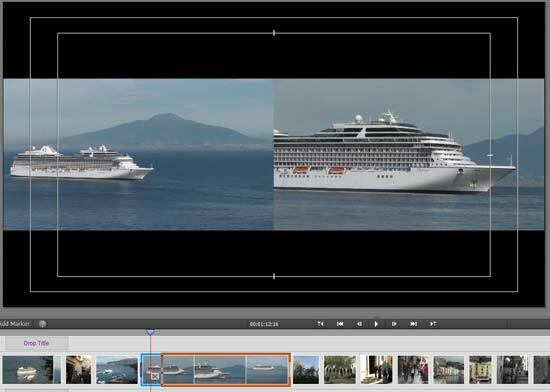 Once rotated you may have to adjust the scale of the video to remove the black edges of the frame. The time line now displays more information than the first Quick edit option, there is a time code above the clips to indicate their duration, or hover the mouse over a clip and a message appears to tell you where it starts, ends and duration. Unwanted sections in a clip can be trimmed by either dragging the ends of a clip inwards or by moving the Red Time indicator over a section which you want to cut. A scissor icon appears on the red line, click the scissor and a cut is made at that point, now delete the section that is not required. 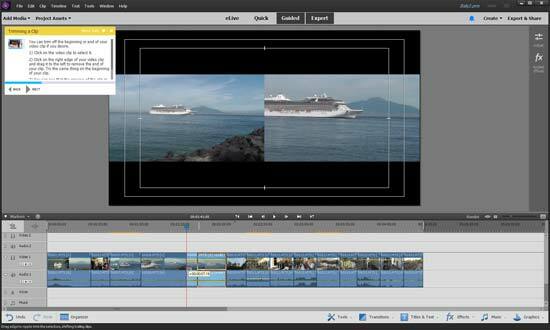 The remaining clips automatically move to fill in the gaps left by the removal of unwanted footage. Nothing is deleted from the original file, you can restore any deleted section by holding the mouse over the end of the cut clip, the cursor now becomes a square bracket, just drag this out to reveal the footage that you just cut.